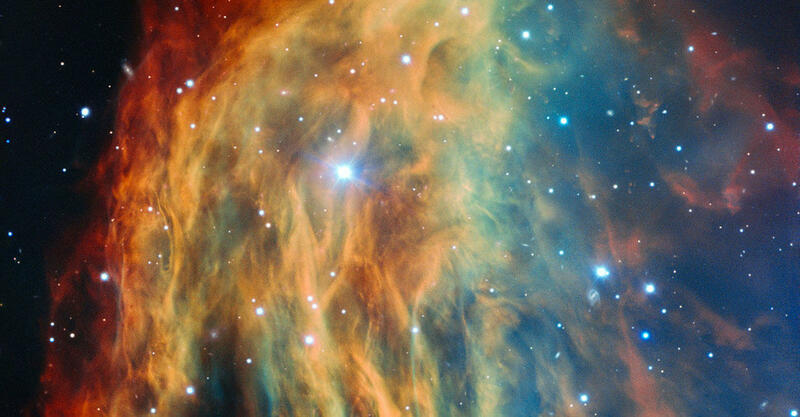 This colorful photograph of the Medusa Nebula foreshadows a possible eventual fate of our Sun, which could shed its outer layers into a multicolored cloud of gas as it cools. Over thousands of years, the kaleidoscopic cloud will gradually disperse into space and the star at the center will begin its final act as a white dwarf. Astronomers captured this image using the European Southern Observatory's Very Large Telescope in Chile. It is reportedly the most detailed photograph ever taken of the structure, which was discovered in 1955 by American astronomer George O. Abell. However, it wasn't until the 1970s that scientists were able to accurately identify the celestial structure as a planetary nebula. It is notable for its large size and relative dimness (in spite of its gorgeous coloration). The collapsed star at the center of the Crab Nebula is only six miles across, yet weighs as much as our Sun.